Dr. Hauschka Intensive Treatments are formulated for skin that has lost its natural balance and requires focused care. Clarifying Intensive Treatment offers intensive care to adults over 25 with acne-prone, blemished skin. The specialized formula supports the skin’s natural self-cleansing processes, guiding skin to a balanced state, refining pores and helping to maintain a clear, calm complexion. Formulation: Rhythmitised dilutions of sage and mercurialis with the gemstone olivine (peridot) act quickly to balance the skin, diminish the appearance of blemishes and visibly refine pores. Witch hazel and rhythmitised chicory balance moisture, stablilize skin and reduce the appearance of redness. Skin Condition: For very oily or blemished adult skin. I love the texture of this serum and how it feels on my skin. Finally a gentle infusion for my skin that adds a dewy glow. Have been using it for a while however do not feel a huge difference between the treatment and a toner. It is just a 1.3 oz of liquid that I spray to my face. I press it to dry then use the clarify daily oil. However, I really don’t see any difference after using this product which costs $95. I actually want to ask for refund!! Overpriced product which doesn't do anything, made no difference whatsoever. I was so excited when I ordered this and it arrived. However, since I have facial hair, I don't believe the recommended amount of sprays 4-5 is enough, therefore the amount delivered for the price is disproportionate. I also accidentally dropped the bottle onto my bathroom counter and the bottle broke. I couldn't get the remaining product out of the bottle and just had to throw it away. I LOVE Dr. Hauschka, and still swear by it, but I don't think I'll ever recommend this particular product to anyone. Skin cells are renewed every 28 days. Mirroring this same regenerative rhythm, Clarifying Intensive Treatment should be used for 28 days in place of Clarifying Toner. After morning and evening cleansing, mist 4-5 pumps onto the face, neck and décolleté then gently press into the skin. One bottle should provide a full 28-day course. Please note that skin that has been treated with oil-suppressive or drying acne products may experience a short, temporary period of adjustment. Water (Aqua), Mineral Salts, Hamamelis Virginiana (Witch Hazel) Leaf Water, Fragrance (Parfum)*, Salvia Officinalis (Sage) Leaf Extract¹, Cichorium Intybus (Chicory) Extract¹, Mercurialis Perennis Extract¹, Olivine¹, Alcohol, Lactose. 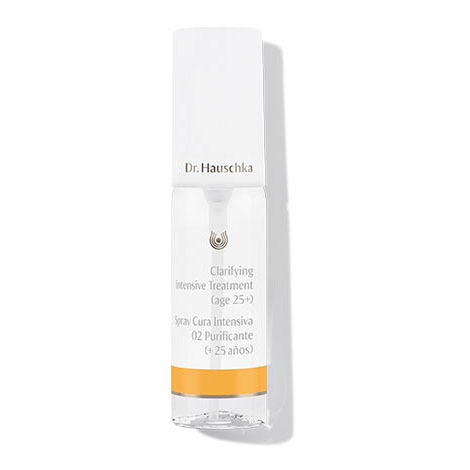 If you are new to Dr. Hauschka Skin Care, begin with a program of basic care using a Dr. Hauschka Cleansing Cream, Clarifying Toner and moisturizer (e.g. Clarifying Day Oil) for a period of four weeks prior to use of Clarifying Intensive Treatment (up to age 25). Learn about our Signature Treatments for Oily, Blemished Skin.